Julia was never going to have it easy this year. 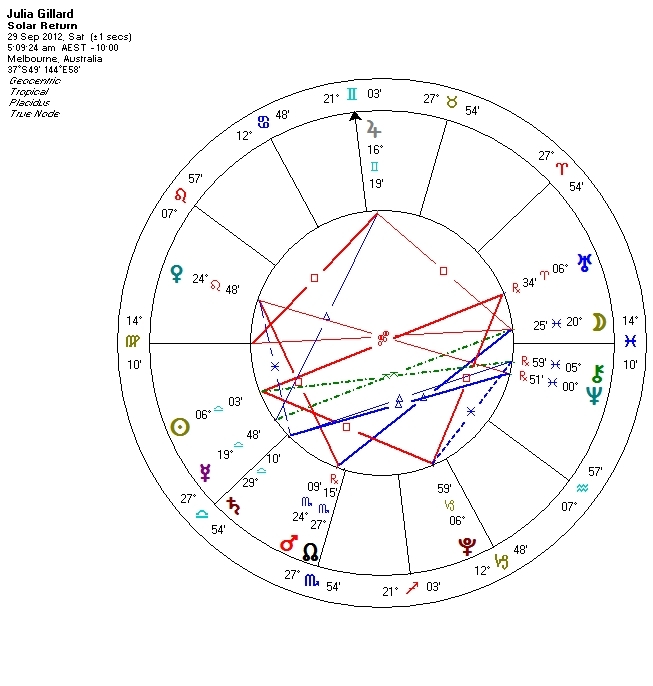 After last weeks’ goings on I was intrigued to go back and have a look at what this year had in store for her, and this is what I found … her solar return chart last year showed that the Sun was exactly opposite Uranus and Square to Pluto at her birthday (29th September). The Solar Return chart is calculated for the time that the Sun returns to the exact position it was at your birth … the idea gives rise to the saying “many happy returns”. And the chart is an indicator of the energies to expect over the coming year. So, for Julia, while it is nice to have the Sun in the First House of a Solar Return, suggesting that she would shine and make a strong impression on those around her, the risk of this placement is that it can be quite self-focussed, and fail to see and feel what is going on in the world outside the self. With the Sun Square to Pluto (in the Fourth House), it was inevitable that she would encounter power struggles that challenged her to transform, and that it would only be through compromise that she would get any resolution from this. With Pluto in the Fourth House, her base was not secure … and it seems that Kevin Rudd, Simon Crean and Bill Shorten made certain of that! At the same time, her solar return Sun was exactly opposite Uranus (in the Seventh House), suggesting radical, unexpected and impulsive changes in her partnerships and alliances. Hmmm … seems that was an opportunity too good for an embittered ex-PM to ignore! The added challenge for Julia is that her next birthday chart (29th September 2013) is still closely wrapped up in the Pluto-Uranus square, with the Sun only 3 degrees away from an exact square to Pluto, so she will still be experiencing powerful forces to evolve … or evaporate. Interestingly, Pluto will be right on her Ascendant, suggesting that she will be exuding power herself (something that she might have appreciated a little more of this year) and she will have the capacity for incredible depth of insight (again, something that might have been useful this year). The bonus for Julia with her next birthday chart is that the Moon and Jupiter will be in her Seventh House, so she should at least find comfort, meaning and growth in her personal relationships. And with her solar return Sun in the Tenth House of social status, and Uranus in the Fourth House of home base, it will be fascinating to see what stage she plays on over the next year or so.